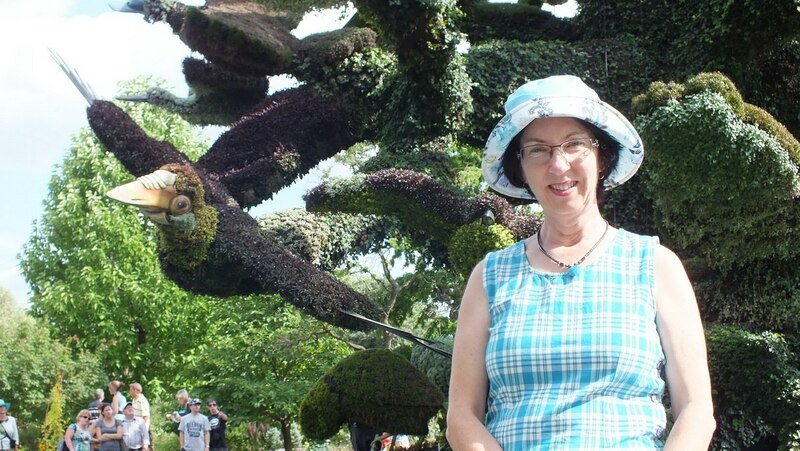 When I read Sonia Day’s article in the Toronto Star, about Mosaiculture 2013, an international competition being held at the Montreal Botanical Garden, I was consumed with intrigue. 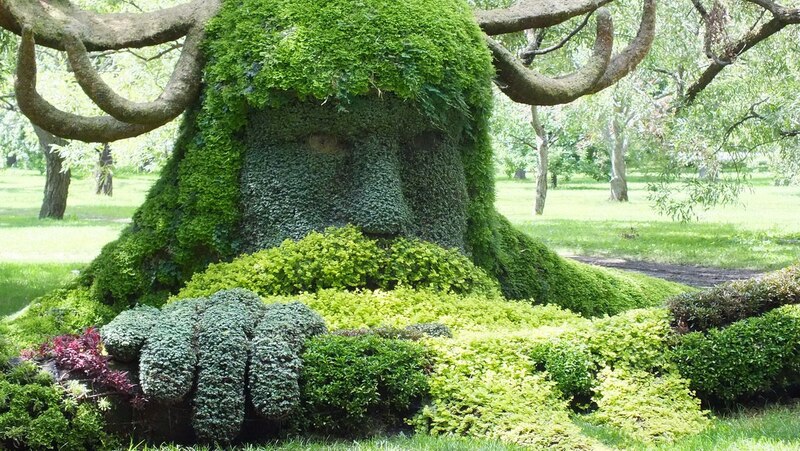 Competitors from around the world had created giant living “sculptures” using plants as their medium, and the theme for 2013’s competition was Land of Hope. Bob, and I just had to go and check it out. 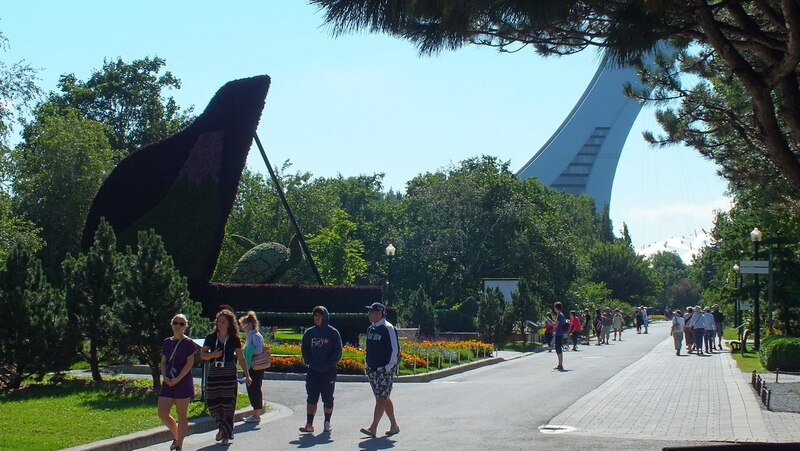 The Montreal Botanical Gardens makes up part of what is known as the Montreal Space for Life, which also includes a biodome, insectarium and planetarium. 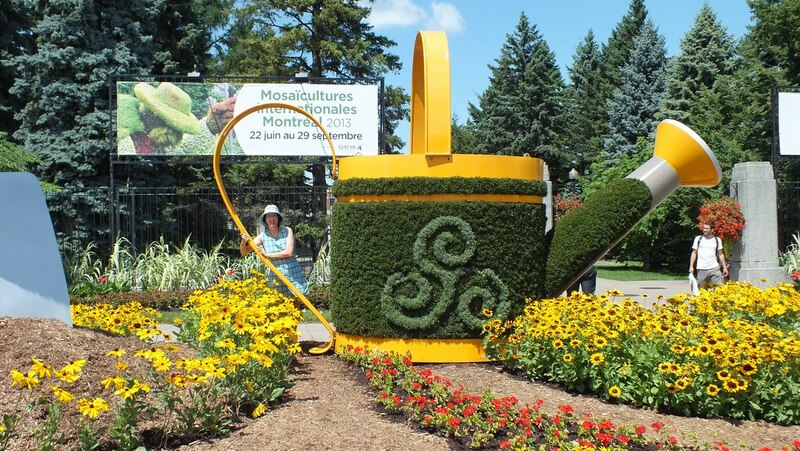 There was no missing the entrance to the Botanical Gardens, or Jardin Botanique, because a gigantic watering can sits amongst the rows of flowers and hints at the wonders to be discovered within. 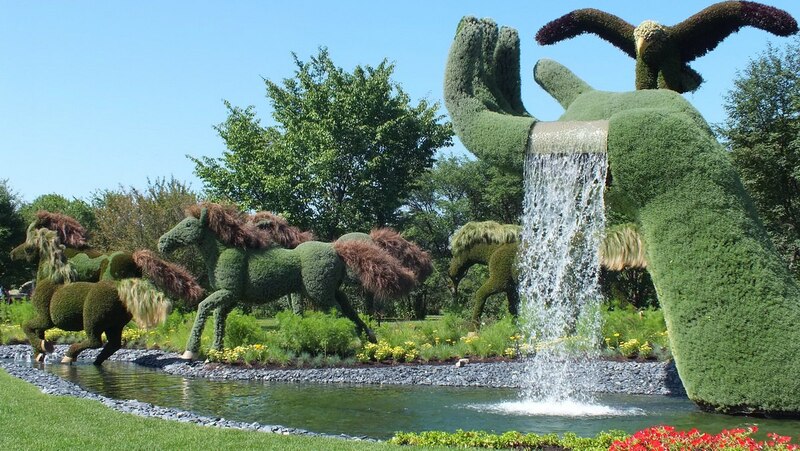 International Mosaiculture of Montreal is a non-profit corporation that was created in 1998 with a mission to promote gardening and horticulture as a crucial component of the urban landscape and an expression of modern values. 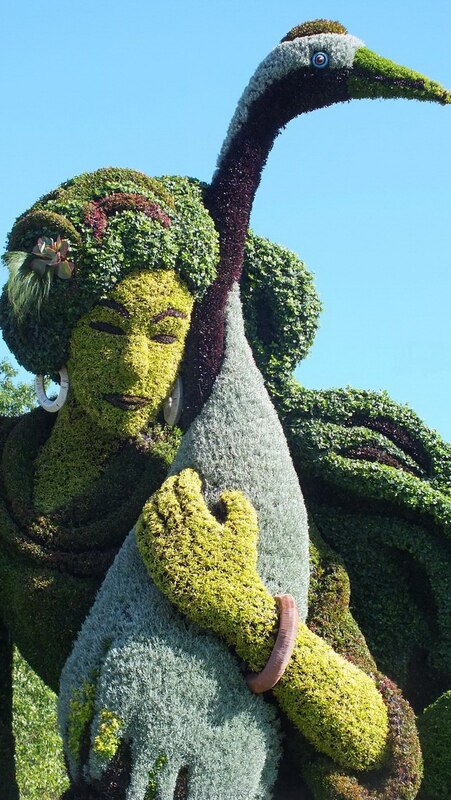 Mosaiculture is now a prestigious international competition hosted every 3 years in a different city of the world. 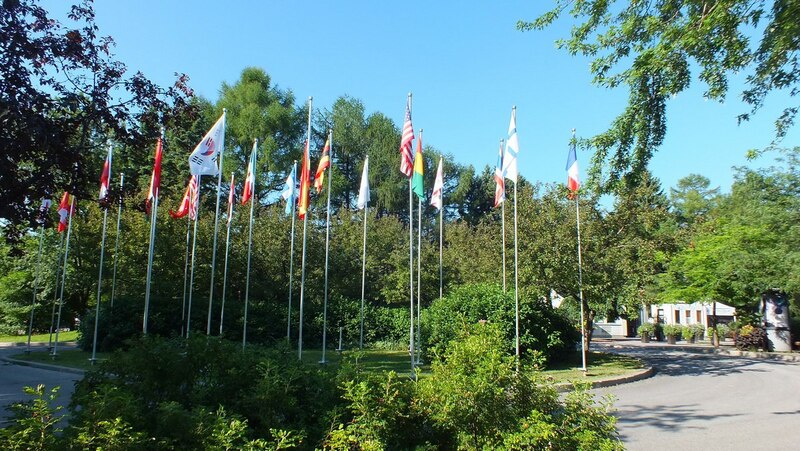 With entries from 20 countries this year, nearly 50 masterpieces are on offer for visitors to marvel at. Bob and I were up bright and early so that we could enter the Garden as soon as the gates opened to the public. 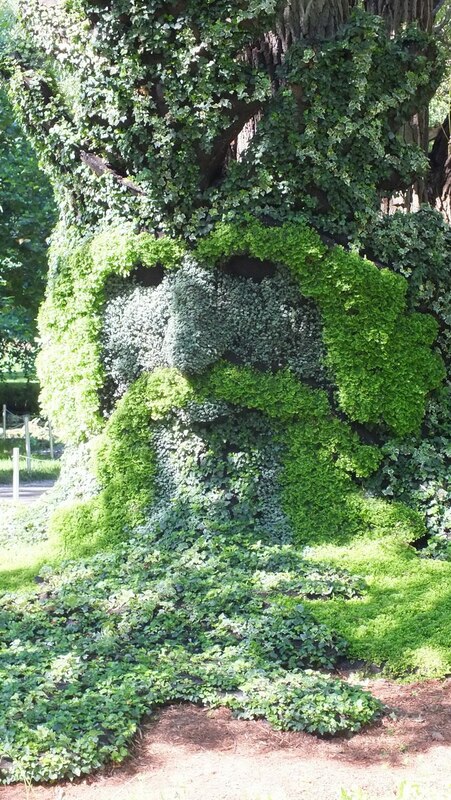 To our dismay, gardeners were still pruning and tending the first “must see” sculpture, The Man Who Planted Trees. The giant shepherd was surrounded not only by his sheep, faithful dog and horses, but the clutter afforded by the gardeners with their stepladders and gardening tools. 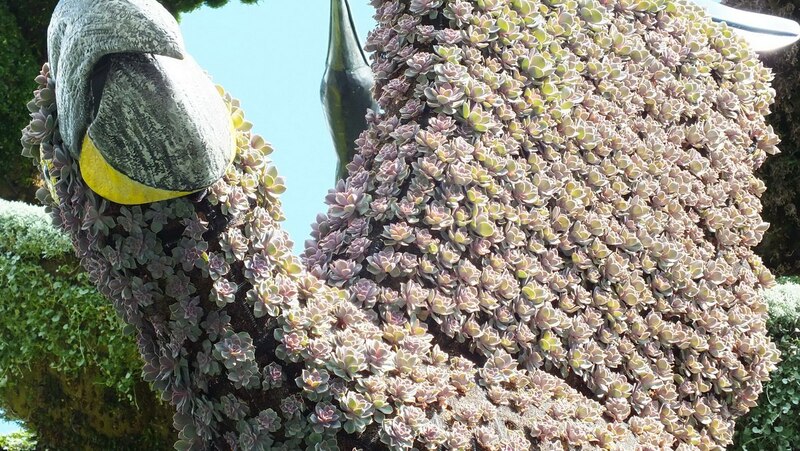 Each mosaiculture consists of a framework, either wood or wire, that is filled with a growing medium through which a watering system was installed. Then, in May, carefully selected plants were placed in the frames, and the growing began. 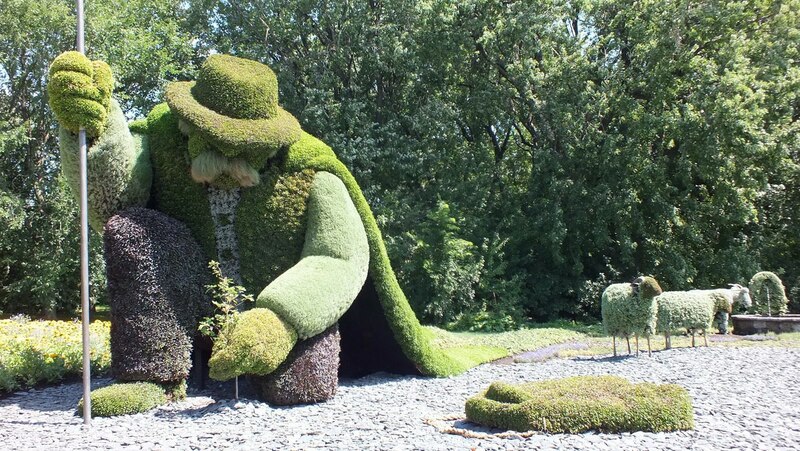 Based on the allegorical tale of a shepherd who single-handedly reforested a desolate valley in France in the early 20th century, this mosaiculture sees the lone shepherd stooping to plant a young tree, his long green cape spread luxuriously behind him. 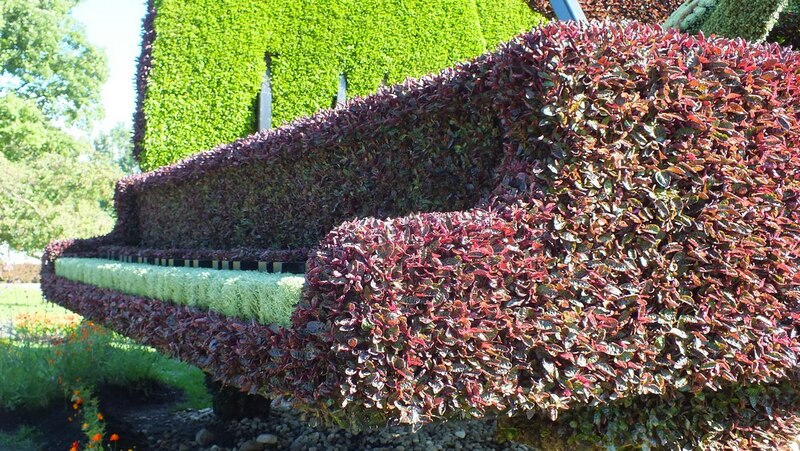 The meticulous detailed construction of the framework has allowed the mosaiculture virtuosos to replicate human features right down to fingers and faces, hair and clothing, albeit many times larger than the real thing. 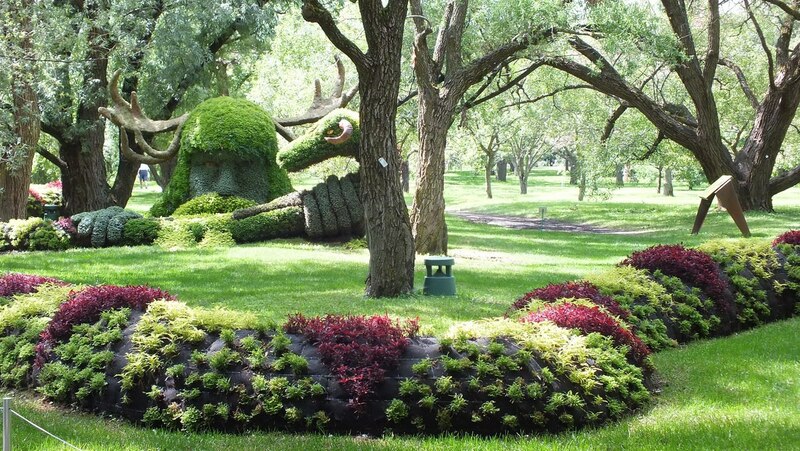 This set of sculptures was created by a team from Montreal, Canada. 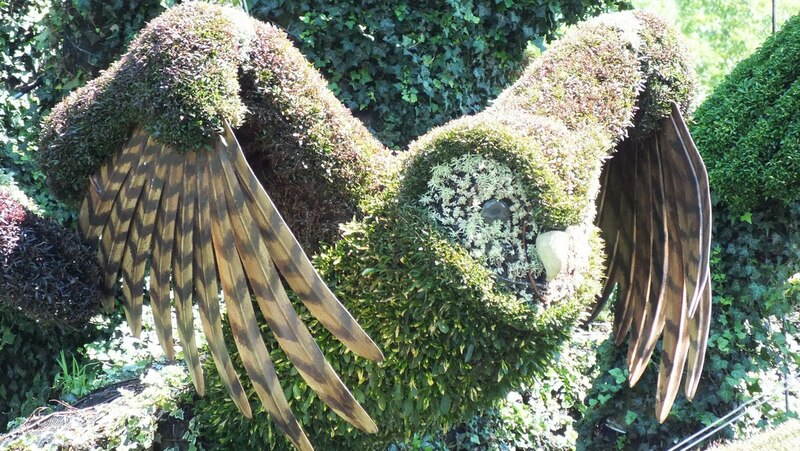 To create the illusion of varied textures and colours of hair, different types of plants, such as grey santolina and carex flagellifera were used to great effect. The amiable countenance of this horse was certainly enhanced by the use of synthetic eyes and ears. 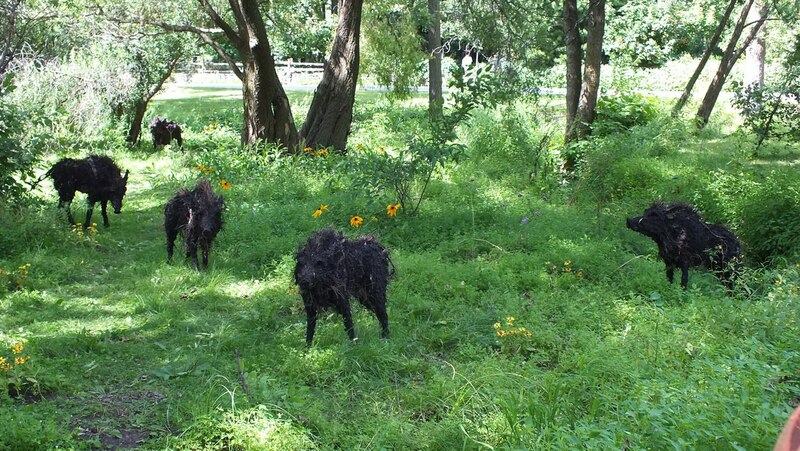 Standing guard over the shepherd’s flock of sheep is this furry dog, and only for its gigantic proportions, one would think that the dog was real because the “hair” is so fluffy and thick. 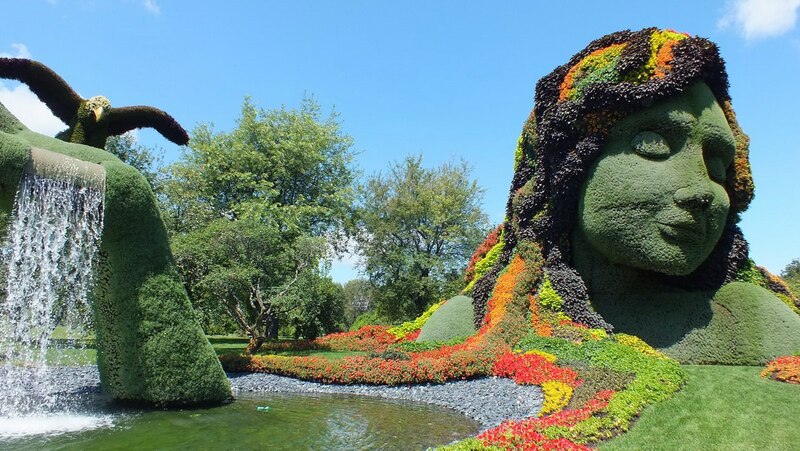 The Montreal Botanical Gardens is located within Maisonneuve Park where it encompasses 190 acres of thematic gardens and greenhouses. It sits within eyesight of Olympic Stadium, site of the 1976 Summer Olympics, seen here in the distance. This sculpture, sponsored by Hamamatsu, Japan, is called: Hamamatsu, City of Creativity: Looking Toward the Future Through a Symbiosis of Man and Nature. My, what a long title! Here, a large loggerhead turtle spills from the inside of a grand piano along with a stream of water under a background of snow-capped mountains and alpine forests. With localized classical music providing an acoustic background as we pondered the meaning of this exhibit, it reinforced how idyllic natural habitats can be when guaranteed with a source of fresh, clear water, clean, sweet air and a safe environment for the animals that live there. 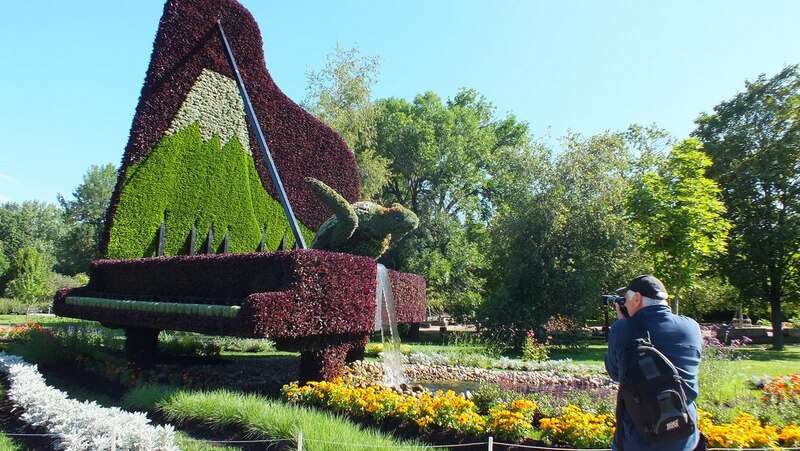 Hamamatsu designed this mosaiculture as a tribute to its industry of manufacturing musical instruments as well as its conservation efforts such as those to save the endangered loggerhead turtle. Being a piano player, I was tickled with the representation of the piano keys, both black and white, along the length of the keyboard. 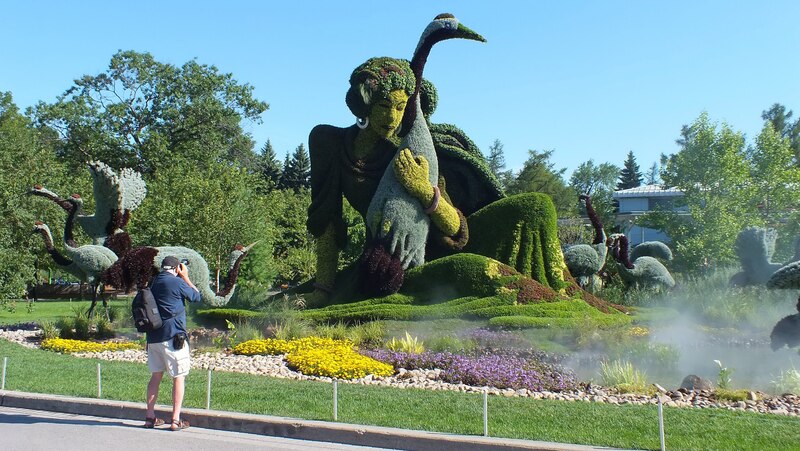 This mosaiculture presentation was very touching as it conveyed the essence of a true story. Sponsored by Shanghai, China, A True Story depicts the tale of a young Chinese girl who, from a very young age, loved Red-crowned Cranes (Grus japonensis). After graduating from university, Xu Xiu Juan traveled very far, to Yangcheng Nature Reserve, where she was involved with caring for the cranes. One day, while trying to save an injured crane, Xu Xiu Juan slipped into the swamp and never was seen again. She managed to save the crane, so the moving story spread far and wide across China. Thousands of people were touched by Xu’s loyalty to and love of these rarest of cranes. The depiction of the story included a fog-filled swamp where potential mates were engaged in their mating rituals. 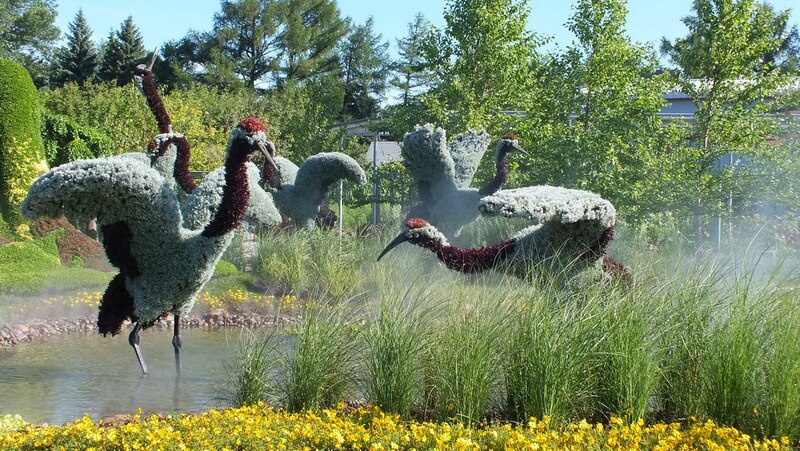 The Red-crowned Cranes seemed to float in the air with heavy mist passing gently over them. 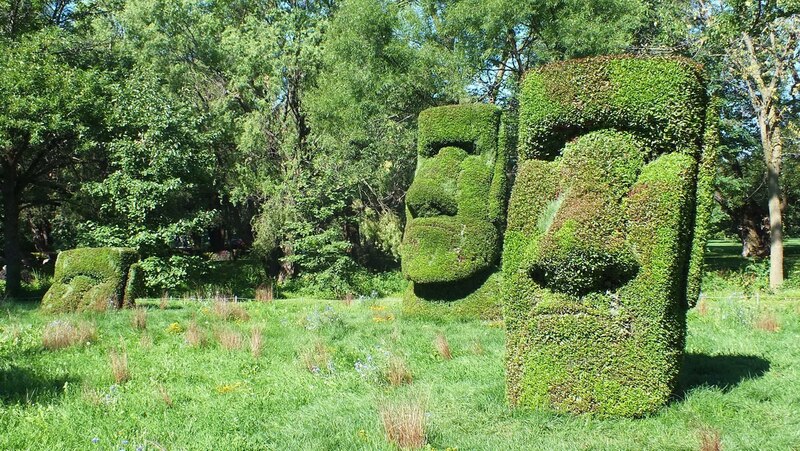 There was no mistaking the representation of Easter Island by Chile, with several replicas referred to as Guardians of the Island. 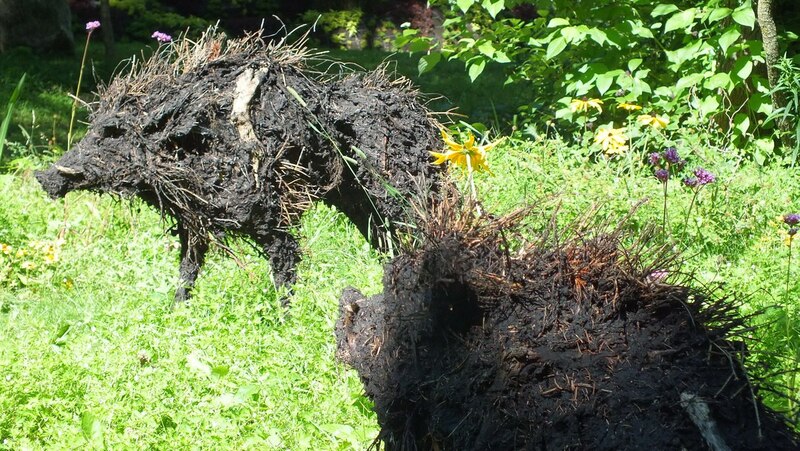 with the result that the rustic boars appear bristly and threatening. A herd of them graze leisurely in a swamp, just as they might on Sally Island. 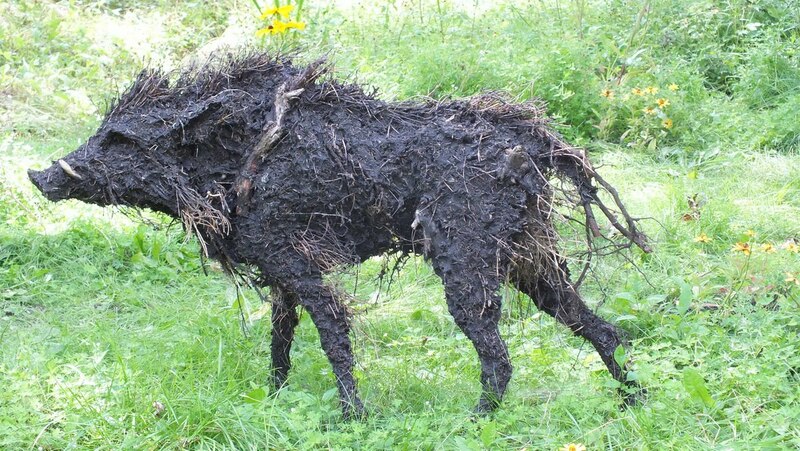 A series of living sculptures called Spirits of the Wood ranked right up there as some of my favorites. 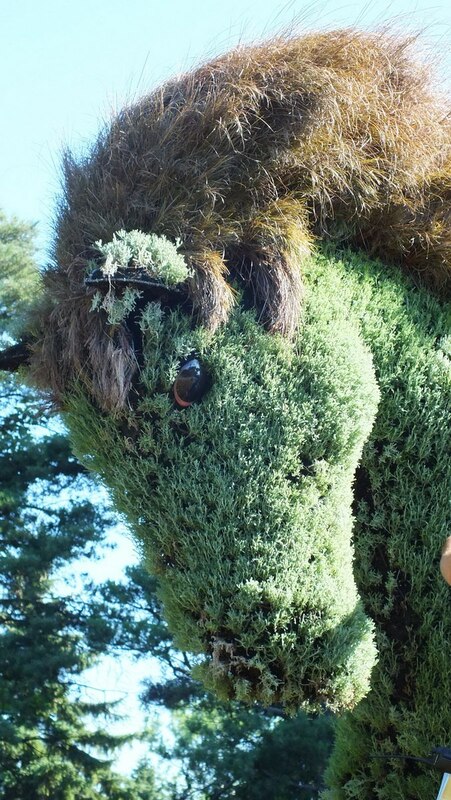 Incorporating a clump of tree trunks against which to model The Green Man was genius! 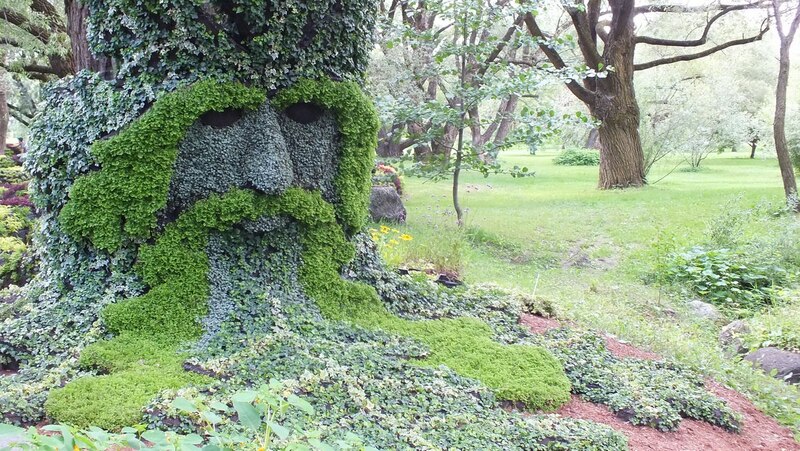 His entity seems to be one and the same with the trees and the earth. So cleverly designed as to make it difficult to distinguish the spirit’s crown from the tree trunks, this sculpture did, indeed, encompass the spirit of the trees. 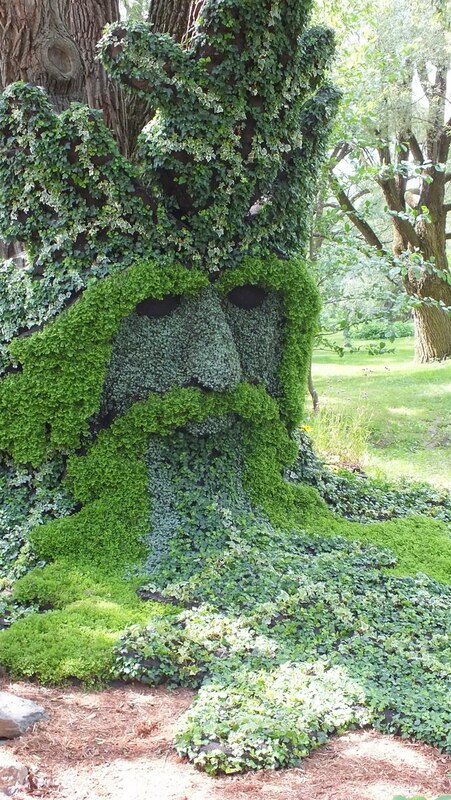 The Green Man is often interpreted as a symbol of rebirth, representing fertility and the cycle of growth each spring. 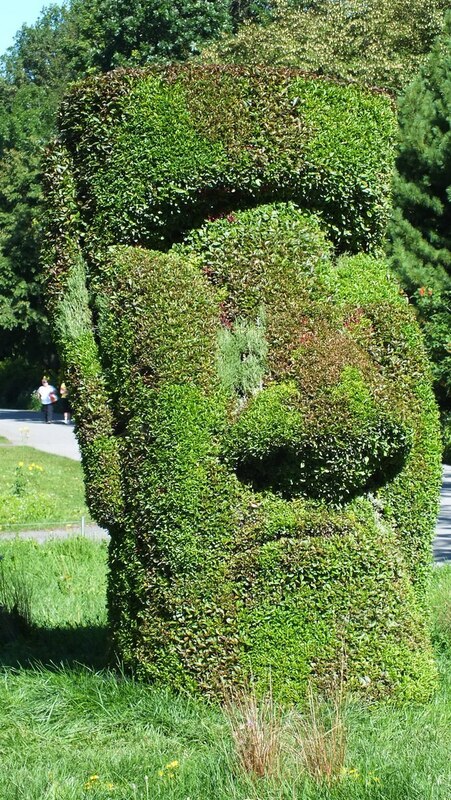 Two of my own favorite garden pieces are portrayals of the Florentine Green Man. Each serenely looks down on my garden, evoking a sense of peace and calm over my urban sanctuary. 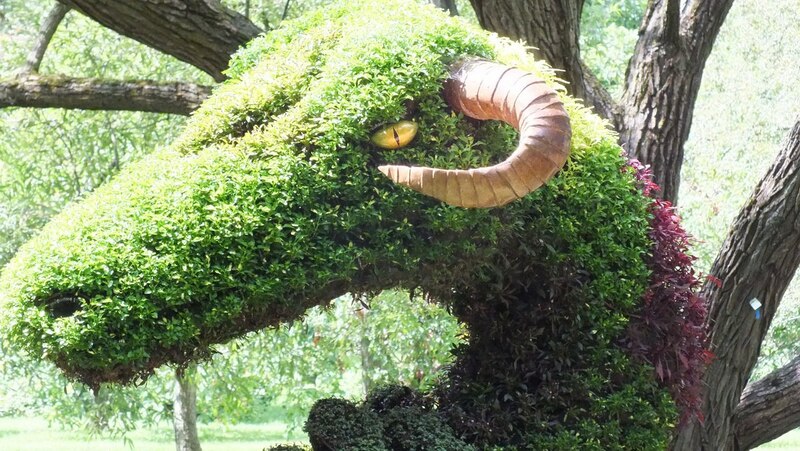 As if leading us to the next Spirit sculpture, the enticing contours of a long sinuous snake lured us along the walkway, its red and green body hypnotically wound in and around the tree trunks. The snake’s writhing body is gently held aloft by the next Spirit of the Wood, Cernunnos, an ancient master of the animal kingdom. These stunning Spirits of the Wood were put together by a team from Montreal, Canada, and therefore are only for show, rather than being judged as competitive entries in this year’s competition. They were magnificent! Spirits of the Wood were located close to one another in a shaded woodland that supported the impression of the sculptures emerging up out of the lush, green forest floor. We were glad the trail passed beneath the trees as they afforded a cool respite from the hot sun that day. In Celtic literature, the horned deity, Cernunnos, is most often depicted with animals, in particular a ram-horned serpent, leading scholars to think of him as “Lord of the Animals”, a peaceful god of nature and fruitfulness. and the symbolic power of the canoe. 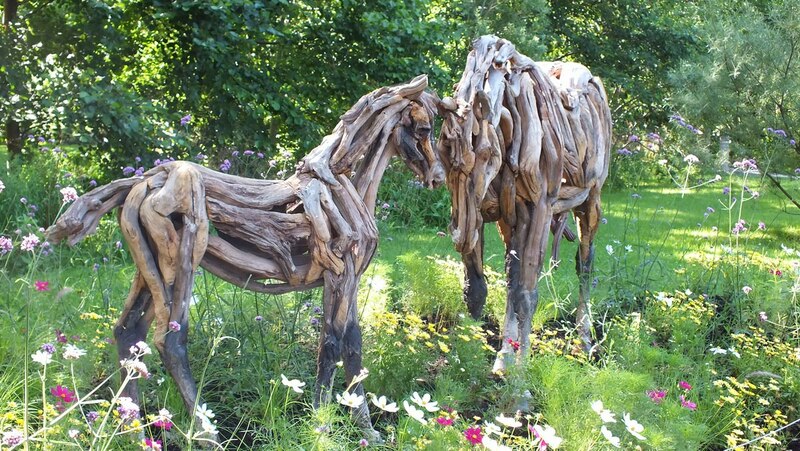 Hope and Odyssey are the names of these two life-sized horses, a mare and her foal, that share an intimate moment in a pasture with flowers bobbing in the breeze. 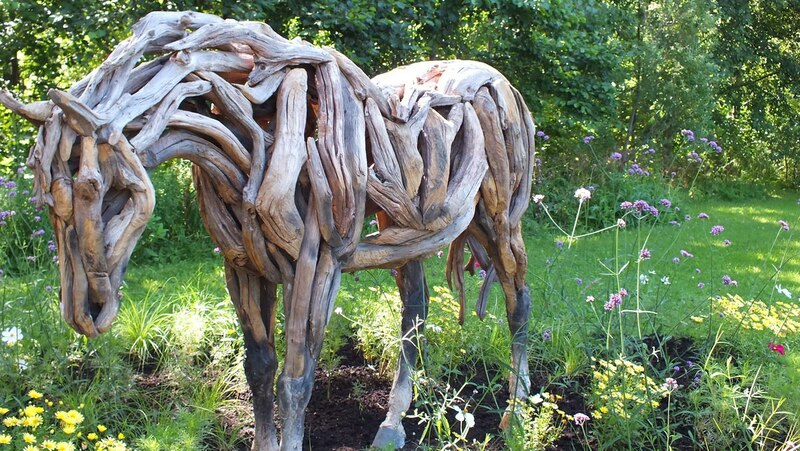 I love that the creator, Heather Jansch from England, used only one material…wood to create these equine beauties. And not just any wood, but sticks and branches that were bleached and worn smooth by the passage of time. It required months of searching to find just the right pieces that could fit together without the need for cutting the weathered wood, and that could be lodged securely against one another without the use of secondary materials to hold them in place. 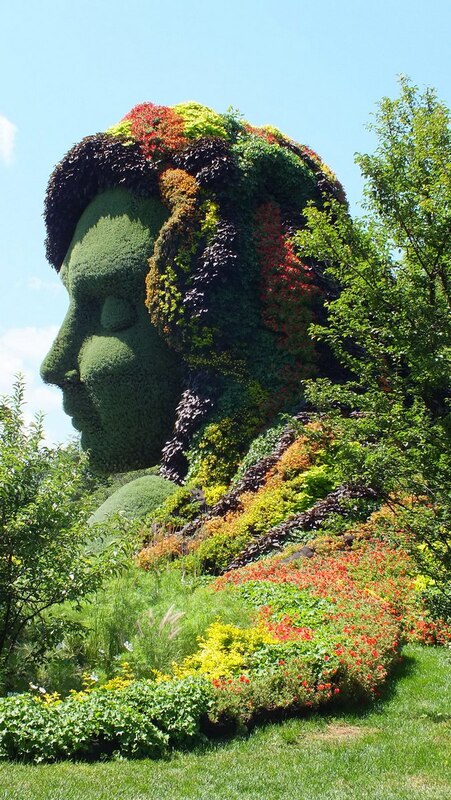 For Bob and me, the most outstanding mosaiculture of the whole 2013 exhibition was Mother Earth, constructed by a team from Montreal, the host city. The work is based on the beliefs held by native peoples of North America that man, animals and Earth are all interdependent. I couldn’t agree more, and that is why this creation resonated with Bob and me so strongly. 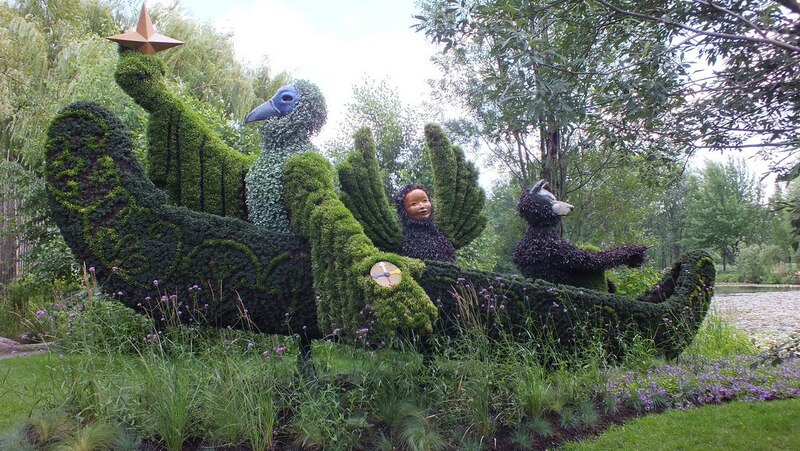 Its creation was inspired by the Declaration of Interdependence written in 1992 by David Suzuki for the United Nations Environmental Summit in Rio de Janeiro . The masterpiece artfully sets the tone for the Land of Hope theme, and carries it out to the nth degree. 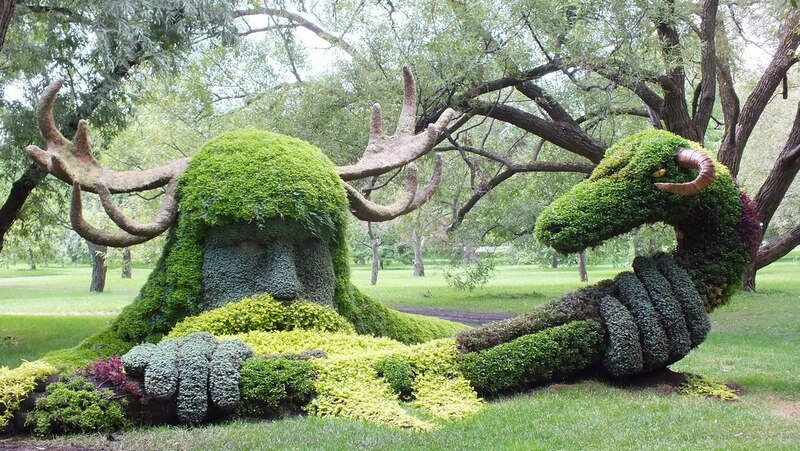 The colossal head and shoulders of Mother Earth soar to a staggering 15 metres high. Her hair is plaited with colourful flowers while the smooth skin is carefully clipped santolina. while her other arm extends gracefully over the land, with her hand deftly cradling a number of deer. and a herd of bulky bison roam the simulated prairie to great effect. 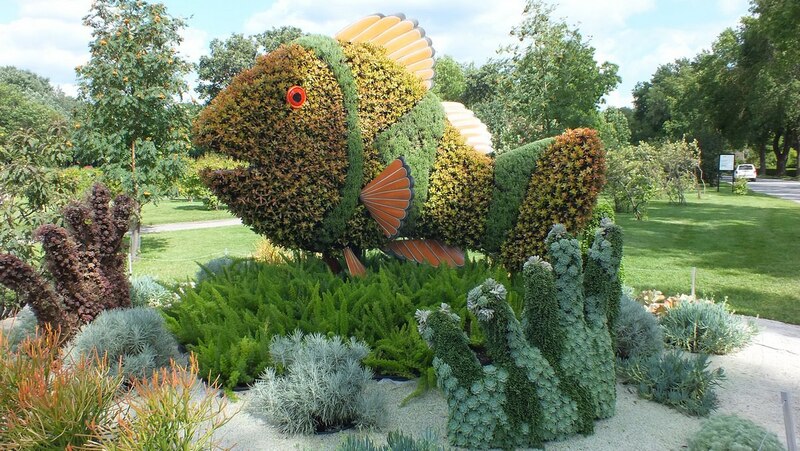 A happy little mosaiculture, when compared with the monstrous Mother Earth, was an entry called Small Clownfish and Anemone, created by a team from Okinawa, Japan. It speaks to efforts being made to try to protect such vulnerable tropical fish. The ocean floor was very convincingly portrayed using succulents and asparagus fern. The Coral looked so real! 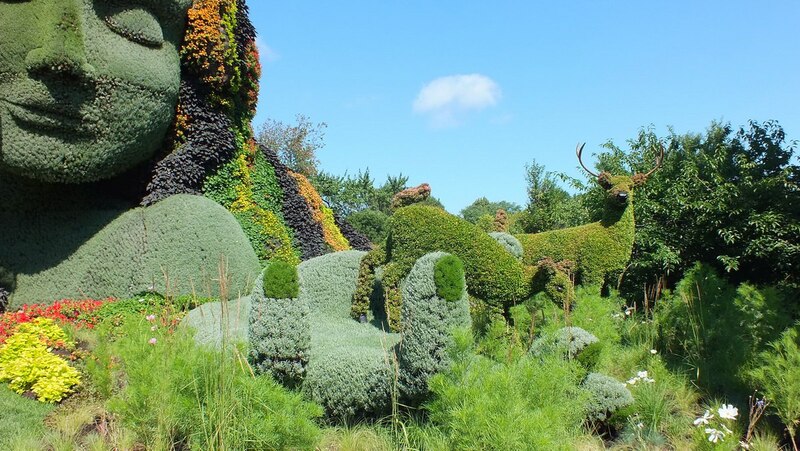 In Bob’s video, you will see a quick overview of some of the mosaiculture exhibits as well as some of the 80 gardeners tending to the maintenance of the plants. 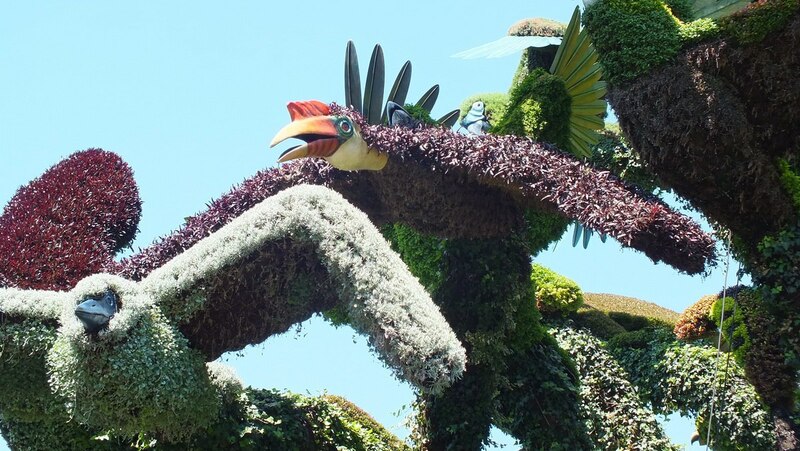 Another grandiose Mosaiculture 2013 that had us in awe was the rendition of an ancient Chinese myth called Planting Plane Trees to Attract the Phoenix. It is intended to explain to people that, through hard work, the environment on this planet can become increasingly beautiful, and our happiness can flourish. That sure inspires a sense of hope! The legendary Phoenix is believed to be the bearer of happiness and a symbol of peace and harmony, while plane trees can live up to 1,000 years, and so are a perfect example of longevity. 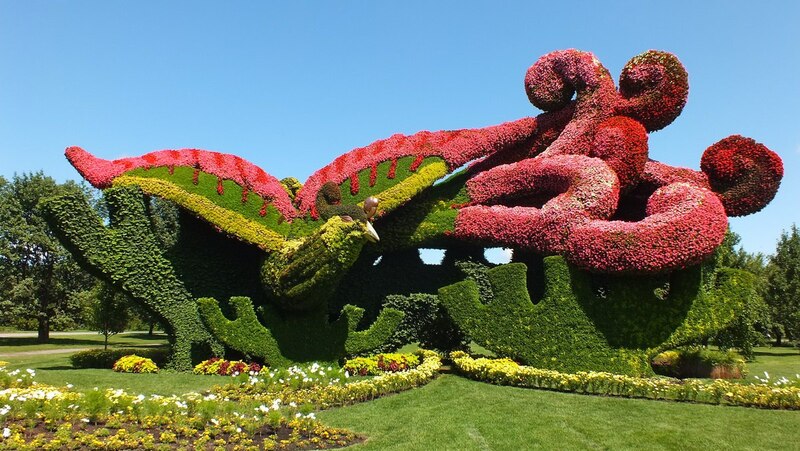 Massive plantings of red begonias are used to depict the phoenix’s multi-coloured plumage, and the sight is jaw-dropping. This Mosaiculture 2013, put together by a team from Beijing, China, includes a number of beautifully contoured components that are intended to reflect the positive actions that humans have on their environment, the symbiosis between Man and Nature, and even suggest a harmonious musical movement based on sustainable environment. It sure was impressive! 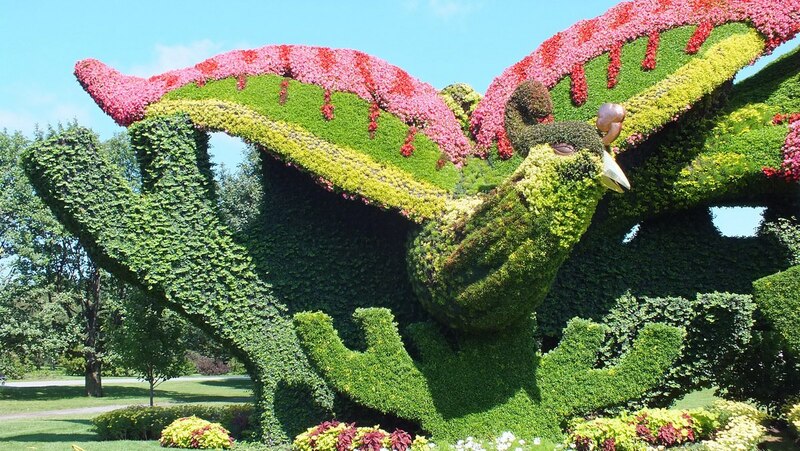 The most outstanding and quite unbelievable mosaiculture to grace the grounds of the Botanical Garden was created by a team from Montreal, Canada, and it is called The Bird Tree. 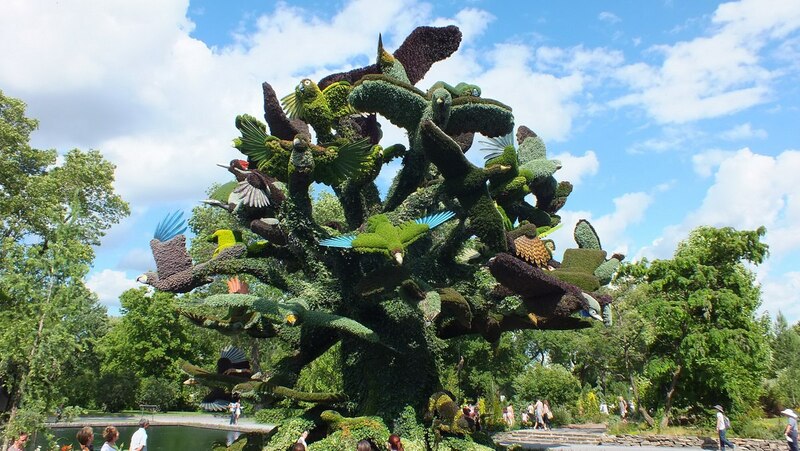 Shockingly, the Tree of Birds is 6-storeys tall and depicts 60 species of endangered birds, reptiles and amphibians presently at risk on Earth. 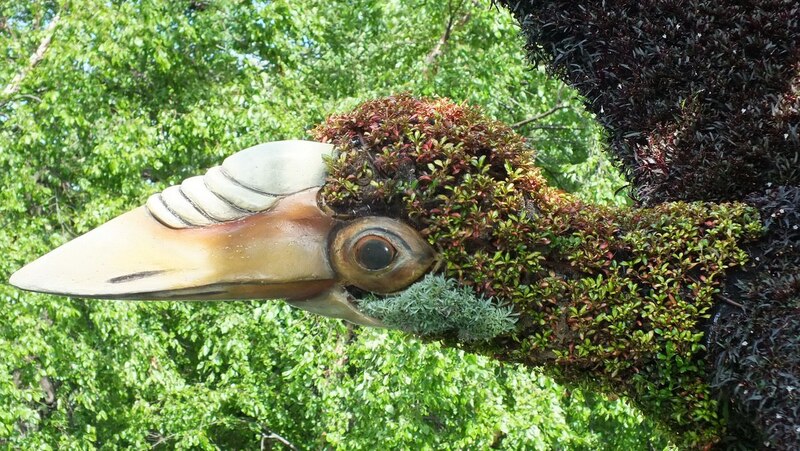 From the tree’s trunk, the branches extend forth and magically transform into such birds as the Andean condor, peregrine falcon, whooping crane and 53 other species of birds flying outwards as they try to escape their fate, extinction. The showpiece weighs over 100 tons, and took the team of a structural engineer, landscape architect, horticulturists and irrigation specialists over 6 years to plan and execute the magnificent structure. 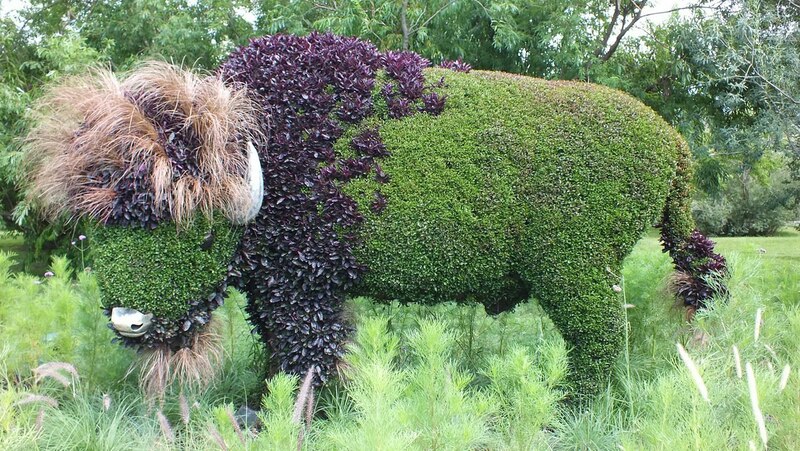 More than 200 species of plants were required to complete the desired result. As Bob and I contemplated the probable sad fate of so many exquisite birds, a soundtrack played in the background of all the bird calls associated with the endangered birds on display. 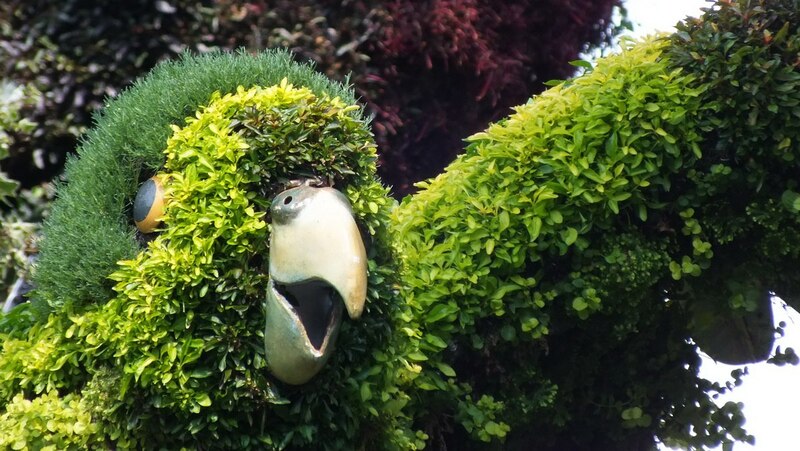 The parrots in some cases were 4-meters long, and in all cases, the plants were chosen to accurately reflect the true plumage of the birds. 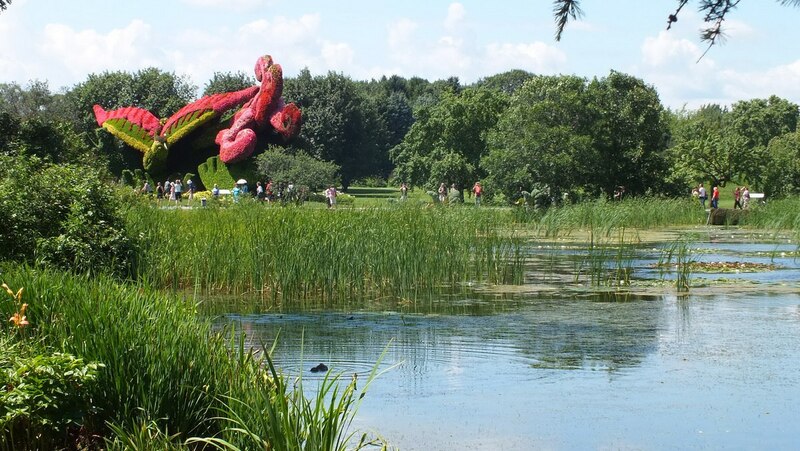 The magnificent concept for this work of art was inspired by Harvey Locke’s mission to develop a program to protect the natural areas of the world before it is too late. Specialized climbing skills were required for both construction and maintenance, but the result is a very poignant reminder of the beauty and fragility of life in so many varied habitats throughout the world. With the Tree of Birds rising from a still pond, it seemed natural that endangered amphibians and reptiles were poised ready to slip beneath the water while far above birds, such as this owl, launched into flight. The whole spectacle seemed like nothing short of a miracle. 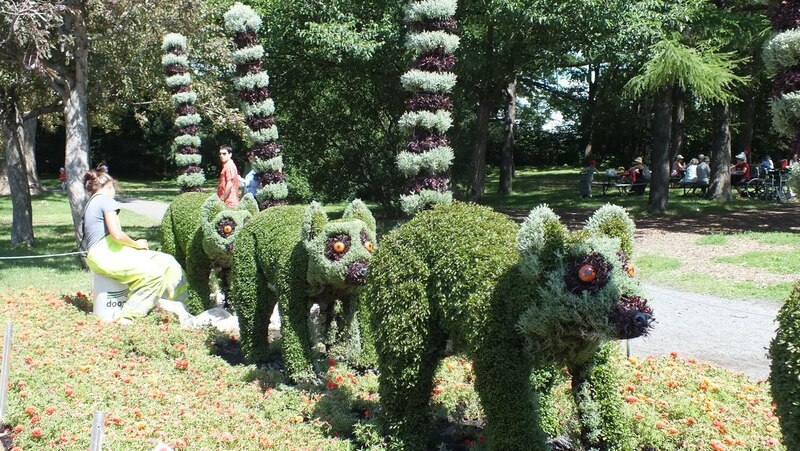 Capturing the eye of many young visitors was this comical rendition of lemurs, called All in a Row. 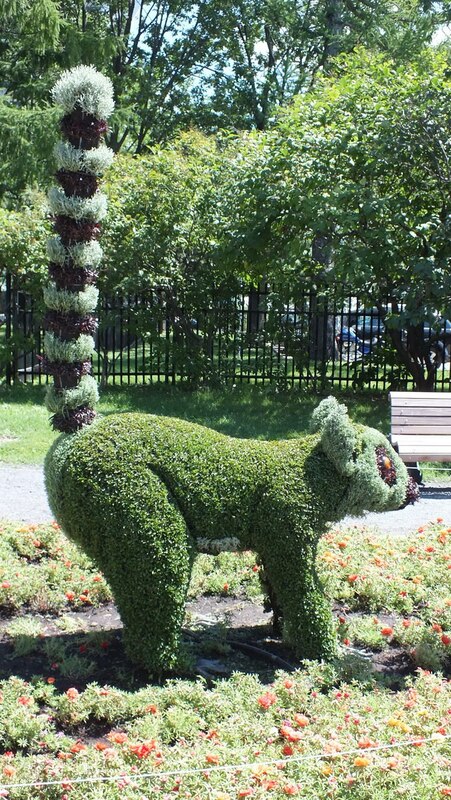 Not so funny, however, is the fact that these iconic, native animals of Madagascar are another endangered species. With their tails held erect, the family of lemurs tread carefully through a flower bed, nose to tail, all the while looking a bit dazed. 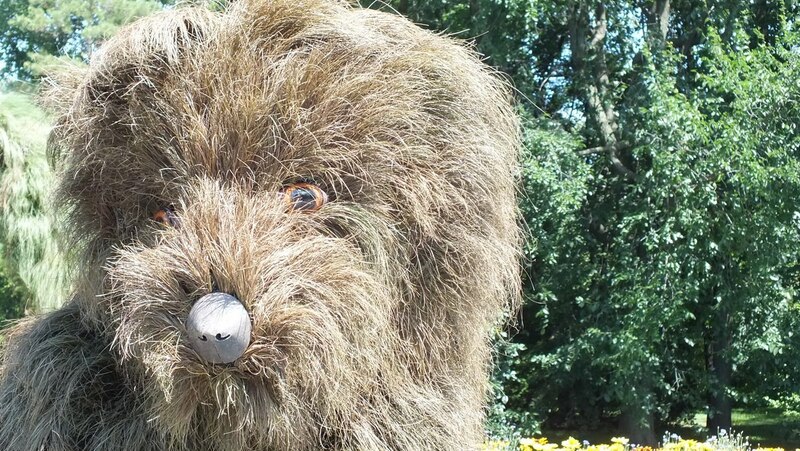 What maked this horticultural show such a knockout was the impressive scale. 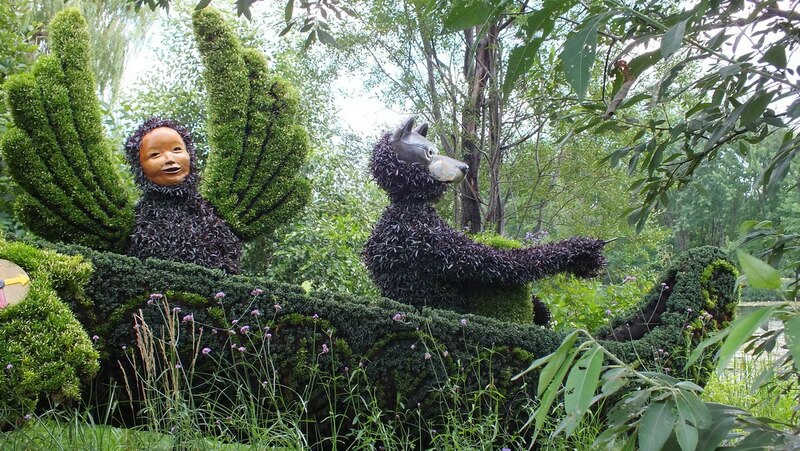 Over 50 sculptures were scattered along a 2.2-kilometre trail throughout the Garden, each one demonstrating high technical quality, innovative concepts and poetic beauty. 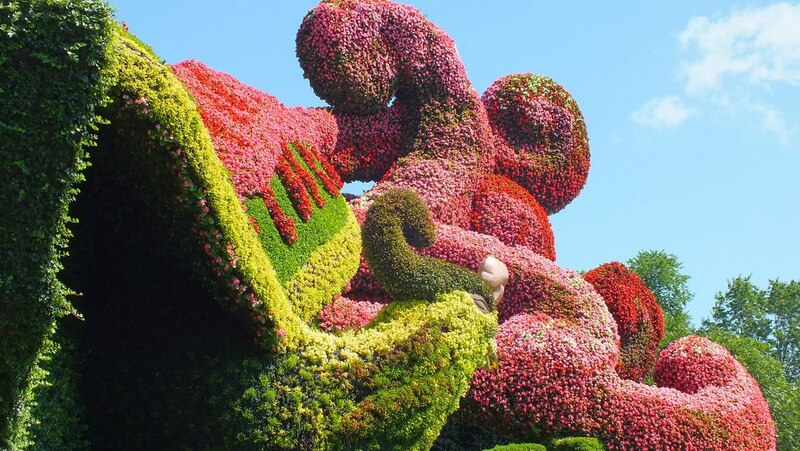 Mosaiculture draws on sculpture for its shape and volume, painting for its palette of colours, and horticultural design for its use of flora…which, in this year’s competition, included over 120 different species of plants for a total of 3 million plants in total. That is astounding! 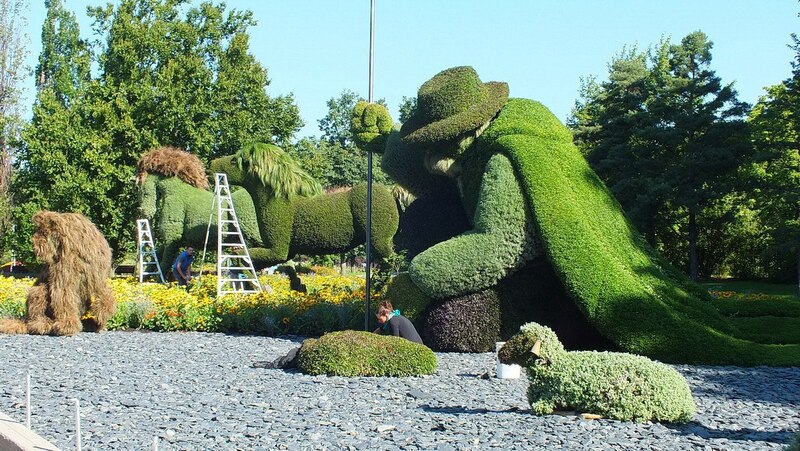 Being avid gardeners who have toured many significant gardens around the world, Bob and I were more than impressed. 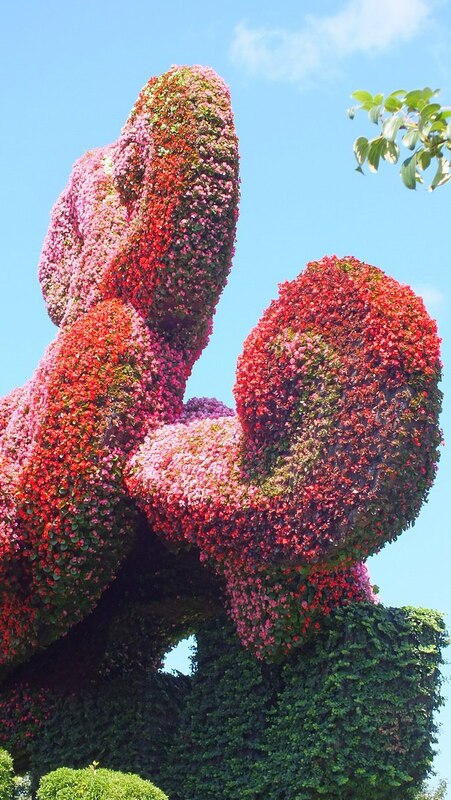 We look forward to the next Mosaiculture! Thanks, Dora. 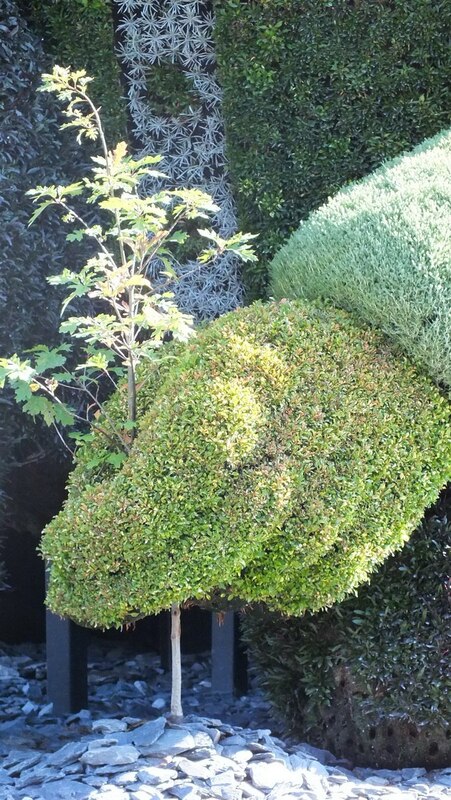 We get great pleasure out of our own garden at home, so any opportunity to explore a different take on growing plants and making them into art could not be missed. 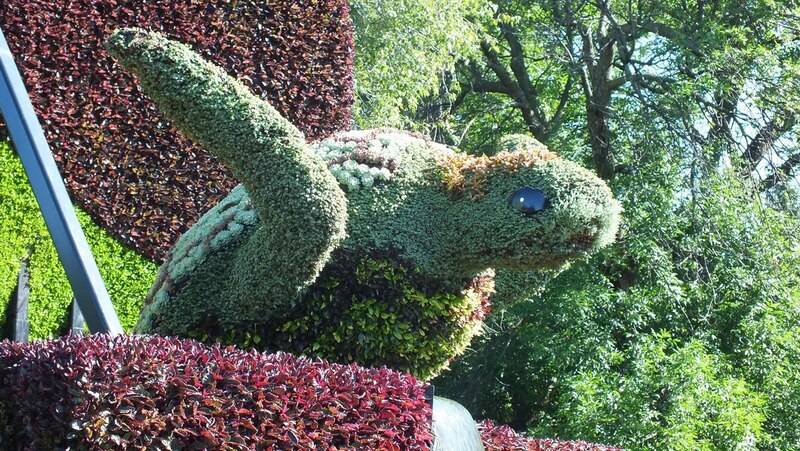 We were fortunate that the Mosaiculture exhibition was within a reasonable distance of our home. I’m sorry I didn’t see some publicity about this beforehand—we live near Buffalo NY, not too long a trip from Montreal, but had no knowledge that this was taking place. Your photos are a great way for me to see it, and I thank you for sharing them. They, and it, are wonderful! thanks, Marcia. We had no previous knowledge of such a gardening exhibit either. It was only a small editorial in our local newspaper that tipped us off to the magnificent living sculptures on display. I was hooked when I saw just one photo. Thank you for your comments. Thank you sooo much for sharing your photos. 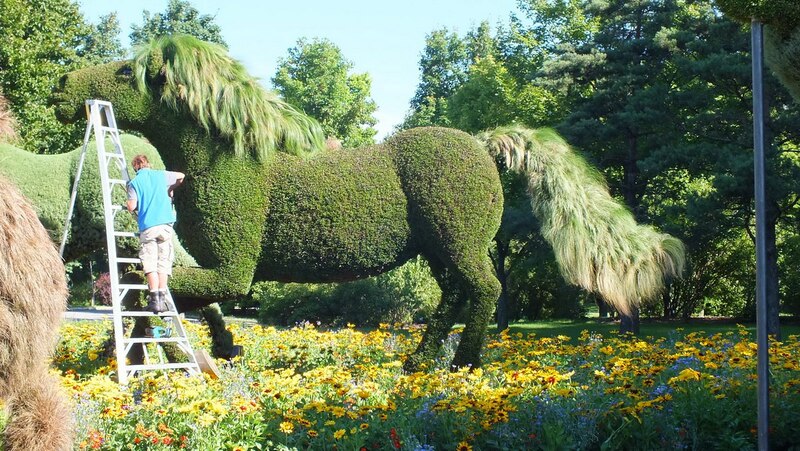 This is truly one of the most beautiful gardens/emails I’ve seen. What a pleasure to read the captions – your message is a joy. Thanks for your comments. I’m glad you enjoyed reading our blog. We try to infuse each story with the excitement and joy that we get from the experience. I thought so, too, Blake. 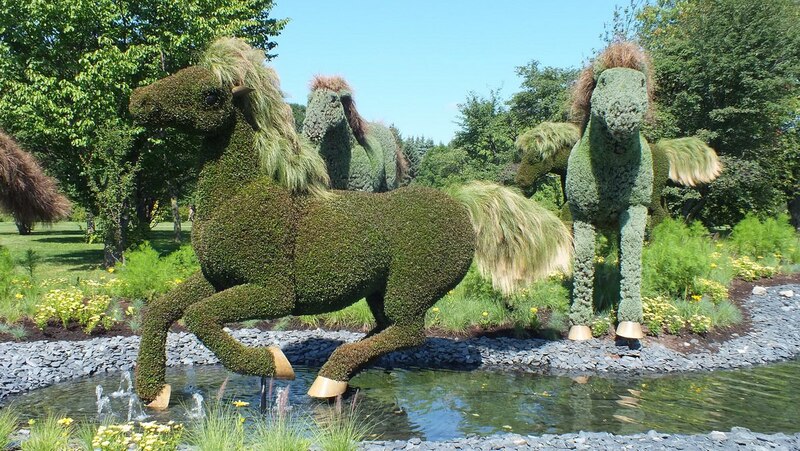 The plants used to imitate the manes and tails of the horses behaved just like real hair in the breeze.